When it comes to learning the ABCs... let the good times roll! This preschool desk features innovative technology that provides a fun and engaging way to learn the alphabet, phonics, spelling, and more. Just roll any letter tile to magically bring it to life. Teaches key prereading skills through the power of sight, sound, and touch. Fun sounds, music, and special textured letters add to the multisensory experience.Three Ways to Learn: Teach--Introduces the alphabet (A to Z), corresponding phonics and words, plus fun sounds and colors. Test--Quizzes preschoolers on letter identification, color recognition, and simple spelling. Tickle--Plays fun music, and kids can create a musical letter rap by rolling any tile. 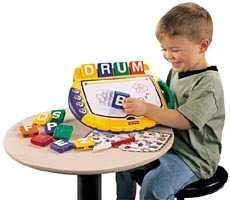 Additional Features of the play with letters desk: Writing surface with dry-erase marker encourages writing skills Textured letters and Braille for tactile learning Letter display area for spelling practice Spelling and picture reference card Storage area and carry handle Volume control and automatic shutoff.